How well do you know the history of your country, read this piece to be informed. 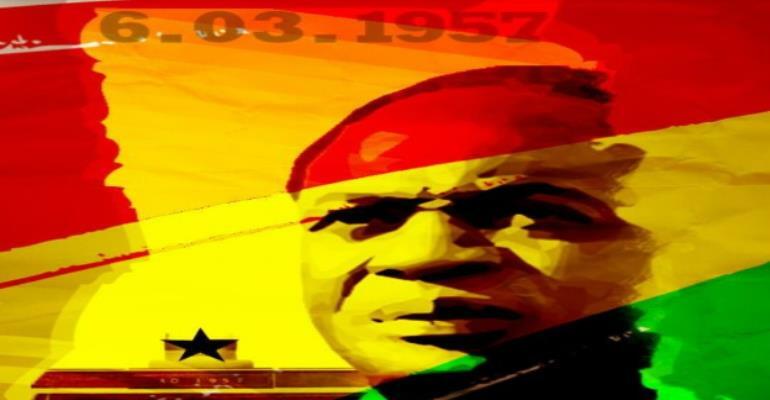 Nkrumah, the star of Ghana and the kind of leader which does not exist any longer in Ghana and Africa as a whole. You can hate Kwame Nkrumah and call him whatever name, including a dictator, but the true fact remains that, he was one of the best, fearless and powerful leaders in the world, not even in Africa. Nkrumah was a kind of leader foreign powers could not penetrate to ransack our resources or commit any clandestine crimes. He was the kind of leaders who does not want to achieve success alone but wanted to pull others alone as a move. What kind of a leader would society want more than this? We ought not to be greedy by thinking that, Nkrumah was bad because he could not develop Ghana, do not follow the crowd-ask yourselves after Nkrumah, what kind of leaders are we have now? What are they do for us? Are they any better than Nkrumah? In the 21st century, Africa remains the only continent where natural resources are abundant and accessible and still the vast remains untouched by the neocolonialists. The natural resources in Africa, have, therefore, become a curse to the continent. This is so because, foreign powers have taken control of them at the expense of Africans. It would neither be morally just nor be politically wise for African leaders, including Ghanaian leaders for that matter, to associate themselves with foreign powers who consider themselves intelligent and superior, to destroy the African continent with strange diseases in such a way to take control of our resources. Yet, we have the resource but we cannot development. What a curse? Nkrumah if people had bought into his ideology, we would have lived like our colleagues in the Americas. There is no advanced country in this world, an African leader could commit a crime without facing charges, sanctions or trial, at the International Criminal Court, let alone using a biological weapon on the population, yet any foreign country which commits such crimes in Africa enjoys impunity. What are the duties of a president? At least, the president of the Republic of Ghana is the guarantor of the rights and freedom of every citizen and in accordance with the Constitution, he takes measures to protect the sovereignty of Ghana and the population. Nkrumah did not only protect Ghana but the entire African continent, yet things were not so bad like what we are witnessing in the country today. Ghana is plagued by corruption, armed robbery, and professional assassins and they do it without fear of being punished. What could have been more dangerous and harmful than all these? Yet we do not try any attempt to assassinate any of the presidents but we tried 5 assassinations attempt on Nkrumah who was busy trying to give us our freedom and right to man ourselves. When you research on the internet to read news pertaining to Ghana, the only thing you see is: Robbers Hit Police Officer, Bolt with His ¢80K at N1 Highway, Bawumia Admits Dumsor Partly Caused by Debt, Police Open Fire On Dumsor Demo, 2 Injured and IMF Restrictions Caused Cedi Depreciation—Bawumia (Joel, 2018). Any Ghanaian leader must acknowledge the fact that Ghana will never be a successful country, no matter how hard they try, if, after colonialism, China has taken over to loot the continent. Moreover, there will never be a successful African country if they will continue to accept financial assistance from foreign governments to support the fight against Aids and Ebola projects on the continent. They have to stop taking that money as soon as possible as a warning to the US government that enough is enough because these biological weapons are affecting our economy. Nkrumah would not have done these, he was so visional and believed in our own state structures and dreams. Can African leaders do that? I don’t think so, after all, because most of them ventured into politics because of the gain they get from it, therefore, how can they reject the dollars or pounds given them as a way of manipulating their minds? This is annoying because they just look at the citizens’ sufferings and sell the country to foreigners. But if they can even reject briberies, the continent will be free from the test of dangerous biological weapons. Ghana lacks a good leader; this is a fact that any intelligent Ghanaian must accept because things are falling down in the country. Can another Nkrumah come one day to continue his uncompleted works and teach those criminal foreign governments a real lesson? Only ignorant and hypocrites will accept that Ghana is getting better amidst collapsed banking institutions, unemployment, and depressive economy, which often is accompanied by: “We are still struggling to clean the mess the NDC left.” But the question they often refuse to answer is: With how many ministers? It is high time we have stopped this nonsense and do what is right. Nkrumah did not have such ministers and functionaries as we do have now but he did his best. If he were still alive, we would have experience the change that we wanted. Many might think he was a dictator but let us ask ourselves “if you were the one that plans were plot over to kill you, what would have done? Walk freely and killed?” why have we failed to reason and believe that, all that Nkrumah did was self-protection and for the unity of this country since others wanted to split us in their quest for ruler-ship. It is most stated that, a state need a unified national voice to develop and that is exactly what Nkrumah did. I stand for the interest of the people and together, we shall always fight for the change that we deserve.